The other day I blogged about how to use your editing software to get a white background when using a cheap camera. Today I'll discuss a few of the design elements, which I think are important when designing your light box. 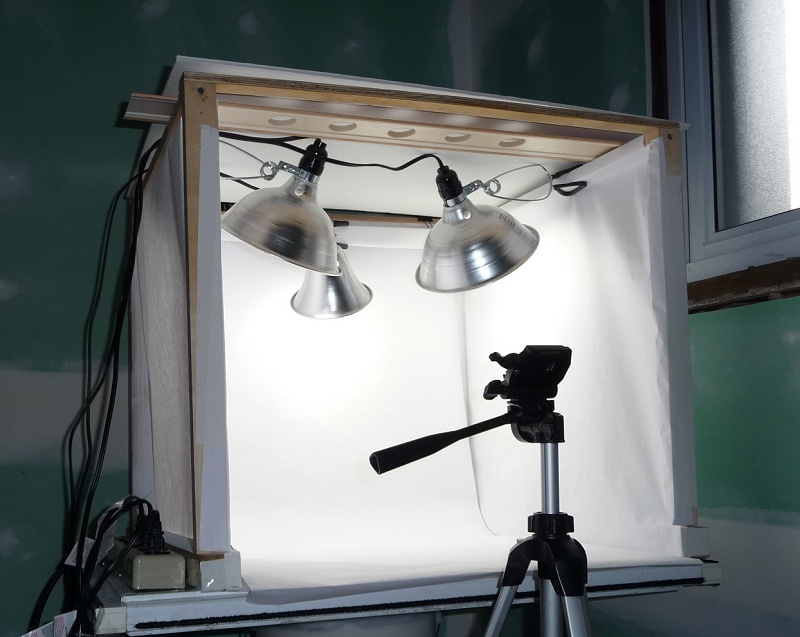 There are SO many tutorials on how to build one that I'll that part alone and stick with the "things to keep in mind" part of building a light box. The photos I've posted are of the light boxes that I have made (yes, it sits in an unfinished room right now). Do whatever you want, these are just things to keep in mind. What size? Well that depends on what you are taking photos of. Keep in mind though that the bigger the box the more lights or stronger lights you will need to fill the box. Also keep in mind that your photos should not include the sides at all; in other words you need to be able to center your subject away from the back wall (remember the back is curved so you can only put your subject so far back anyway) and have it completely centered without capturing the sides (unless you are good with the clone tool :)). See my previous post on what sizes I had and what I just made if that helps you decide. You could do a mock run to see if what you are thinking will really work too. Try setting an item that you might photograph in your light box 4" away from a wall. Now place 2 items on both sides at the width that you think you want to make your box (an upright object would be better... bottle of glue, can, ketchup bottle, CD case on edge), now measure away from the wall the depth that you might make your box. Zoom, focus, look. Are your sides in view? Can you crop them out? What is that your photo will be posted as? If you built a box with these dimensions would it fit your needs in the end? Hey, nothing worse than spending a lot of time on something then discovering it's the wrong size. What materials? The first question is what do you want your box to be made out of. 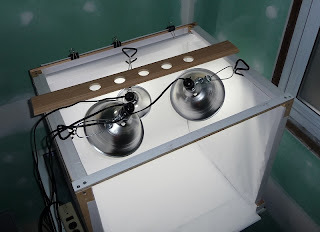 GOOGLE "how to build a light box", which is probably how you got to this page anyway, and get a few ideas. Perhaps you don't want to spend $ on PVC pieces, don't have a big enough cardboard box, or don't have the tools/wood supplies to build one. If you are going for a very simple, very cheap, I'll hardly use this thing light box I suggest you check out these bloggers creations: poster board, cardboard box, collapsible cardboard box style. For a few dollars you can make one from foam board (they do make tri-fold display foam board too, which would mean less taping. Warning-foam board is shiny and you will probably get a reflection), for more $$ you can build a very sturdy one out of PVC. 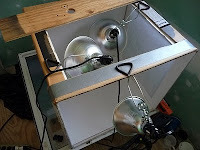 I was going to build my third light box out of PVC with aspirations of making it totally adjustable in size; then I snapped out of my dream state and went with easy and less designing. My new light box was originally a frame I built to catch sawdust from my miter saw; I've since revamped the sawdust catcher and this frame seemed to be the perfect size! Plus who can beat free and already made? color in place. I have other colors stored underneath the white one. What background? The actual background should be matte or else you will get a reflection under your subject. Sometimes this may be a desired effect though. Your background material should slope from the back wall to the bottom, which eliminates shadows and it should be removable because it will get dirty/marred or you may need a dark background to photograph a white/silver object. Also keep in mind that the bigger the box you build the longer/wider your background needs to be. Gluing/taping together a background is just not a good idea so you might have to consider purchasing a roll of white paper. What lights? Whether you make your light box out of cardboard, poster board, PVC or wood scraps there are design elements you should think about. The first thing is what kind of lights are you going to use? If you are using floor/desktop style lights you will be very limited as to the placement of your lights and most likely will need shine the light through your light box rather than into it. If you have/plan on buying clamp on lights you must design for the lights. Clamp on lights are poorly secured to round objects so PVC is a bad choice unless you can figure out how to keep the lights in place. Clamp on lights must have something to clamp onto which means it will need to have edges that aren't covered with paper or permanently attached with fabric. Space can be a factor too. If you build a box that barely fits on a table, you will not be able to use desktop lamps so keep that in mind. The best lights to use are the ones with a rating of 5000k or higher! The higher the number (the one followed by a K) is the whiter the light. Design issues: With the one I just made I decided to cover it with paper from a 4' roll (no seams). Fabric would work well too. 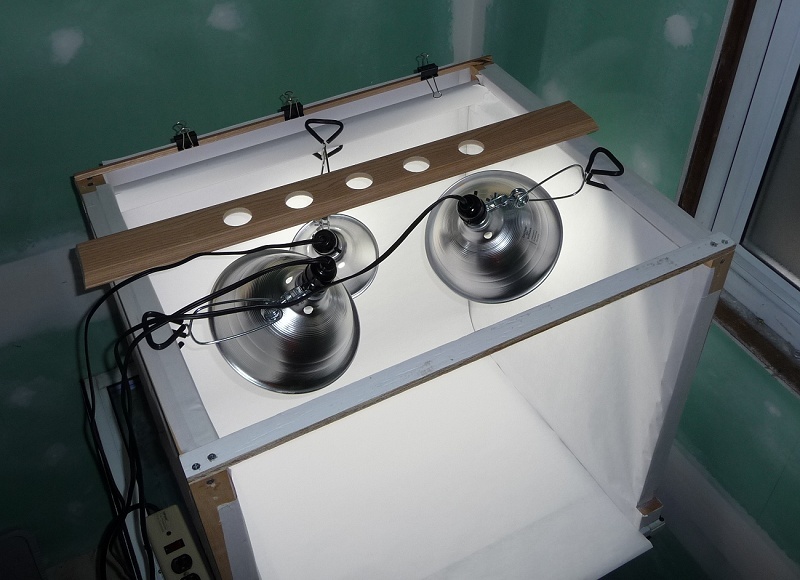 What you really have to keep in mind when making your light box is what kind of lights your are going to use and whether they are going to shine in the box or through the material from the outside of the box. There are really just two decisions. Lights inside/outside? Standing/clamp on lights? Since I know I will be clamping my lights inside the box, I had to cover the frame so my lights could still clamp on. The front opening of the box poses no problem when it comes to clamping on the lights since the paper wrap ends at the openings. For the sides however you must make sure that when covering the material (paper or fabric) isn't stretched over the upper support on the inside. There are two ways to take this issue out of play: 1 is to simply push the paper/fabric to the underside of the top support and tape/glue/staple it so it stays there or just crease the paper like I did and add tape from the front of the frame to give it strength. The other way, which might be easier, would be to make sure the entire frame was white; either spray paint it or wrap each piece of the frame with white paper/fabric. I did a combination of both mostly because I didn't have enough white spray paint on hand. The basic idea is that you take away all of the dark, light-sucking spots so you get the brightest/whitest light. The more challenging place for design is the top-back support because you have 3 things to think about. 1) Covering all of the white 2) making sure the lights can clamp on 3) attaching removable inside backgrounds (I haven't mentioned this last one yet). The back of my frame was really almost perfect to begin with. The top-back support is situated further inside the box than the lower one. So I covered the upper support with white paper to eliminate any light sucking. Then I attached a dowel size piece of wood that you can attach some 1" paper clamps onto. The paper clamps will hold your inside background so it is removable. A word about the inside background and why it should be removable. First and foremost is that white backdrops will will get dirty/marred over time and need to be replaced and secondly you should have other color options for different items you are photographing. Think about trying to photograph a white greeting card in a white light box... not so good; change the background to black/gray/blue and you've fixed the problem! Overhead photos - Since I don't have a tripod that will look into my box, I made a camera holder out of a scrap piece of foam molding. It could be made out of any kind of wood, but I would try to use a piece that is less than 1/2" thick and it shouldn't be too wide. It's simple. Cut a piece of wood that is long enough to span the top of your box. Now measure the width of your lens at the widest part when it extends. Cut a hole that is at least as wide as the widest part of your lens. You will have to move around overhead clamped lights of course. You can see my overhead camera holder in the picture above - I cut several holes for different positions. was smaller/ same concept though. As a final note on cardboard box light boxes, I will suggest that you use a thick cardboard box if you plan on attaching lights to it. You can duct tape additional strips of cardboard to stress points to help firm up thin areas that will have lights attached. Experiments: I mentioned earlier a bit about shining lights through a medium vs shining lights into your box and the lights that you can and cannot use depending on which you choose. You are probably wondering now, which is better? Well, with my cheap camera it didn't matter! I've shined it through fabric and paper and I've shined it in with fabric sides and with paper sides. None of my experiments yielded a best situation outcome and every one of them had to be adjusted a bit in the digital darkroom (see my previous post on this subject).